A sketch of the exhibition, ‘Pink Floyd: Their Mortal Remains’. As soon as you put them on, Roger Waters’ bass fills the headphones, with Nick Mason’s drumbeats adding rhythm. The sound switches on and off as you move, in keeping with the whims of wireless connectivity. The progression is chronological: For starters, this is 1960s England. There is a model of the distinctive red London telephone booth, a replica of the famous Bedford van and a room dedicated to the prism—the design cover for The Dark Side Of The Moon album. This is the Pink Floyd: Their Mortal Remains exhibition, which has been running at the Victoria and Albert Museum in London since May. Less than an hour away, in Twickenham, another ageing band will be performing in front of a giant screen and approximately 85,000 fans. The high-resolution LED video screen, 200ft wide and 45ft high, complements their much-hummed music with colourful imagery and shots of band members. This is U2, travelling through the US and Europe between May and October with their Joshua Tree Tour of 2017. The exhibition and the live show have another thing in common besides music, nostalgia and rock-stardom—the London-based Stufish Entertainment Architects. The designers-architects, long-time collaborators with Pink Floyd and Waters, know a thing or two about working with bands and stages. Incidentally, they also designed the much discussed floating aerostat during the 2010 Commonwealth Games in Delhi. It’s been 50 years since Pink Floyd’s first album. Half a century of the English band’s progressive, psychedelic and moody musical journey, and their idiosyncratic album designs, are being currently showcased at the museum. It’s been 30 years since the Joshua Tree album was released, but the tour—at least for my generation—is an example of how good music seldom grows old. But how does a firm like Stufish design a museum exhibition and a travelling tour; produce and design a stage show (Soho); work with talented artists like Rolling Stones, AC/DC; do the opening ceremony of the 2008 Beijing Olympics and a water show theatre in Wuhan, China, apart from 50 other projects? “We are less concerned about the perceived boundaries of what people would consider architecture or not architecture," says Ray Winkler, Stufish’s chief executive officer. “There is some—if not intellectual, emotional—link between a building in Wuhan and a Joshua Tree Tour which has no foundation and travels every other day to a different city," he adds. Since Floyd had such a strong visual narrative and pedigree, this became the basis for the exhibition design. The designers took recognizable moments—like the van or the prism logo—and used them as set pieces into which the exhibition was slotted. “It was important for us that when you enter the exhibition, you went into the environment of Pink Floyd and not a neutral canvas where you would encounter a host of isolated objects," says Winkler over Skype. Putting together the era’s cultural references, the exhibition tells the stories of band members through memorabilia, documentaries, handwritten lyrics, hand-drawn set-design plans and personal possessions—like a cane that Waters was whacked with as a schoolboy and the letter Pink Floyd Syd Barrett wrote to his then girlfriend. Stufish, short for Studio Fisher (it gets its name from its late founder Mark Fisher), was careful not to make this self-reverential, because there were two worlds coming together at the exhibition—Floyd’s fan base, and a new generation with little or no exposure to the band. “It was clear from the onset that music was the key glue that stuck everything together. So what you saw on the screen and what you heard was seamlessly tied in together," adds Winkler. The reason why Pink Floyd created such stage spectacles was because they wanted to deflect attention from themselves as individuals. But when it came to the design of this exhibition, they were approachable, adds Winkler (three of the four Floyd members, including Mason, had been to art or architecture school). It’s 9 July and there’s still some daylight by the time U2 came on stage, at around 8pm, in Twickenham. Hits from the 1980s started flowing, with songs like New Year’s Day and Pride, before it gets dark and the back screen comes alive. The “Joshua Tree" motif on screen burns orange and the Mojave Desert looks endless as the foursome croon Where The Streets Have No Name. The initial conversations on collaboration between the design outlet and the Irish band started sometime in October. The first designs were shown in December, the concept was finalized in February, and rehearsals started in April. “That’s probably the quickest you can turn around a stadium show of that scale," says Ric Lipson, a senior associate at Stufish who headed the Joshua Tree project. It usually takes somewhere between 8-12 weeks for a relatively normal set to be built. The design, a team effort, depends on a lot of factors, including the band, their management, sometimes their wives, friends, and girlfriends, says Winkler. Additionally, there are production managers, tour accountants, tour bookers, all influencers in what the set needs to look like. From a design point of view, Stufish works with a group of four-five people that expands or contracts depending on the cycle of the show. U2 toured with 30 trucks and 114 people—including vendors and those working with lighting, sets, security, production management, etc. The set took about three days to build and a day or two to take down. The business model that drives the design is dependent on it being put up and brought down as quickly as possible. For they lose money when it’s in transit, says Winkler. Then there is the unpredictability of working with eccentric and picky superstars, like Bono in this case, or Madonna and Mick Jagger. “The challenge is to match reality with ambition, not really people," explains Lipson. “If someone wants that set to be twice as big, we can design it. But it will cost twice as much. “Bono and Madonna are wonderfully ambitious people and their attention to detail is to be regarded with the greatest of respect," he says carefully. “Madonna is a taskmaster. But that comes from a genuine place of wishing to make the best show." India remains a largely distant project for Stufish, despite the aerostat—a helium balloon they created for the Commonwealth Games. It was designed and built in the UK, and given the limited space and absence of overhead rigging, they believe that what they pulled off was radical. “It brought me an understanding of how you make things work," says Lipson. “In our Western way, we think of making something with carbon fibre, but when we worked with art directors in India, we used cane and bamboo. That was amazing." 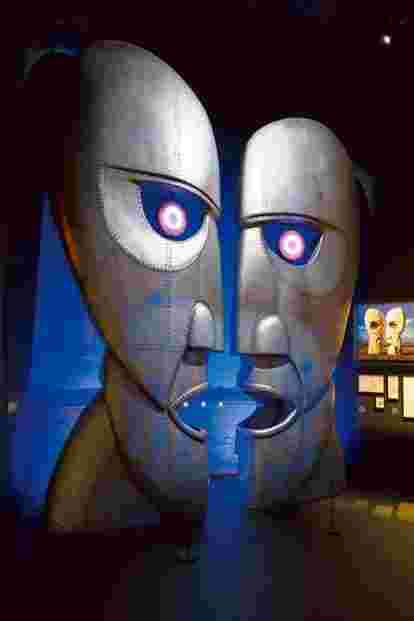 The Pink Floyd: Their Mortal Remains exhibition is on till 1 October at the Victoria and Albert Museum in London. 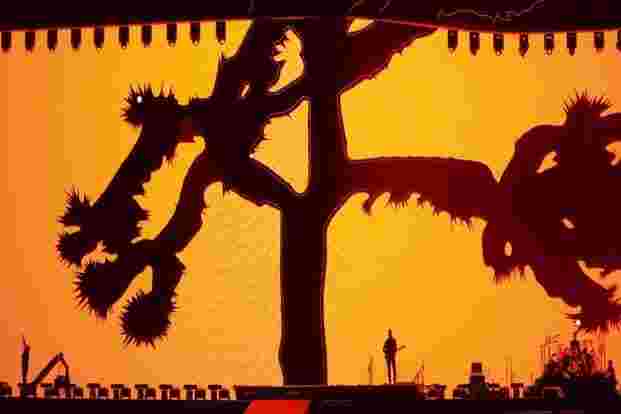 The second, American leg of U2’s Joshua Tree Tour starts from 3 September in Detroit.